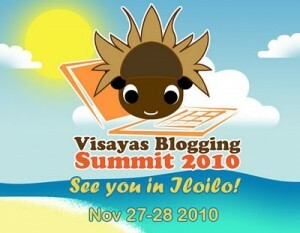 Congratulations to Iloilo Bloggers Inc. for spearheading the first-ever Visayas Blogging Summit in this beautiful city in the middle of the country. Over 150 bloggers from all regions of the Visayas attended the historic event, and all resource persons were in Iloilo City in time for their speaking turns. I join organizers in thanking the sponsors who helped make this event happen. Thanks, too, to Eric of Byahilo.com for inviting me to join the speakers pool who included Aileen Apolo, Flow Galindez, Ria Jose, Jayvee Fernandez, Estan Cabigas, Anton Sheker, Janette Toral, Fitz Villafuerte, Blogie Robillo, and Lloyd Tranco. We are also grateful that Mayor Jed Patrick Mabilog found time to grace the event and to formally welcome the participants. I hope Visayas bloggers take the challenge made by Lloyd in his talk that they seize the social media tools available to them, especially blogging, to (re-)introduce people, cities, provinces and regions of Visayas. There are simply so many undiscovered and untold stories to discover and tell. Now we look forward to the second Visayas Blogging Summit and to Visayans taking a lead role in the formation of a national bloggers and netizens association for the Philippines. I enjoyed your talk Tonyo! Well done!